Barbed wire doesn't look so pretty strung across the top of a fence to keep intruders out, but using old barbed wire as a craft can turn an ordinary object into a rustic-looking piece of art that harkens back to the days of the Old West. You may want to take some care in handling some old barbed wire, but with the right technique and some common household items, you can create your own barbed-wire crafts. Turn old barbed wire into sculptures. Take advantage of the bendable attributes of wire and arrange it into figurines to place on your mantle piece, or use a large amount of barbed wire to create sculptures for your yard. Use your imagination to mold the wire into whatever shape and style you want. Consider decorating with flowers or whatever else you want to add color to the piece. You can also make barbed wire wreaths. Bend a long length of barbed wire into a circle over and over again, interlocking the wire with the other strands on each go-round until you have a thick wreath. Then, hang it on a barn door, in your garage or wherever else you want some rustic decor. 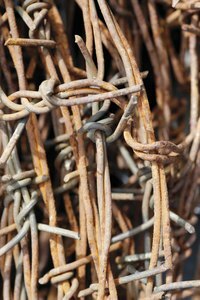 Use the barbed wire in a metal rose craft project. You can cut out pieces of thin metal to use as petals and then weld them to a length of barbed wire that can serve as the stems. Arrange a few metal roses in a vase to make a good conversation piece that you can put anywhere in your home. Barbed wire will add a touch of realism to your farming or ranching scrapbook. You can do this by wrapping a few short strands of barbed wire together and then flattening out the barbs. After that, you can glue the strands to the edges of your scrapbook. What Is an Alternative for a Crochet Needle?